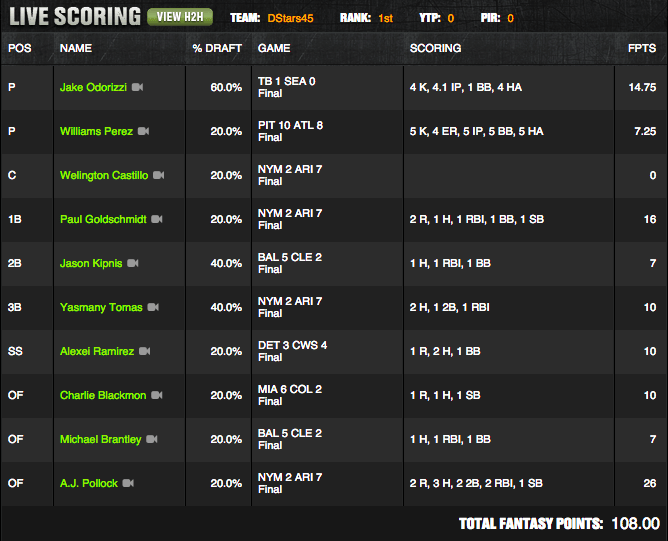 DStars45 received a pretty good effort from his hitters on a mostly quiet night of daily fantasy baseball (unless you were a person that had an Anthony Rizzo or Stephen Drew) which propelled him to his second straight weekly win and the top of the Gentleman’s Game Cup Circuit Standings. Only one lineup surpassed 100 points and in fact, all four contestants other than the victor failed to reach the 90 point plateau. This was due to three contestants in the group using Jake Odirizzi who didn’t go five innings, Swindaman3 throwing 5.25 points Charlie Morton into his lineup, Diamondhoggers had no offense other than Jonathan Lucroy, and JSquad34 received only 6.5 points from Scott Kazmir. So what will happen next week? Will Swindaman3 make it safely back from his trip to Honduras in time to field a lineup? 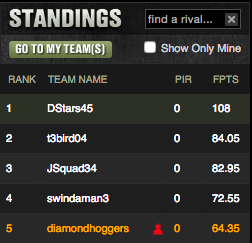 Will Diamondhoggers submit a 60-point effort for the third straight week? Will the t3bird spread his wings and join DStars45 at the top of the mountain? You must tune in next week to find out will grab the upper hand in this game of excellence.